This podcast is the best! Always brightens up my Monday to get s new episode. Makes me feel like talking to some friends. Please donât stop doing the podcast ever! Why do children like animation and not live action? Which way should paperclips face? Dear Hank and John,Which way should paperclips face?I don't know, but I'm a lawyer and we use them a lot. We always have the small side face the front of the pages. My two cents.Love the podcast! And the YouTube channel! Hank and John Rock, editing has gone downhill. Seems to me like the editing of the show has gotten sloppy since the podcast joined WNYC. Still giving 5 stars because I love Hank and John so gosh darn much. They brighten my life. I stopped using YouTube as much as I used to a long time ago, but Iâm super happy to have found this podcast and can feel connected to nerdfighteria again. â¤ï¸Great source for mostly dubious but occasionally serious advice, that will definitely make you laugh. Dear Hank and John has made me actually lol (like in the original, traditional sense) while listening through headphones in populated spaces, which is something I try to avoid. This is basically hank and john doing audience QA. Sometimes when they have good insights , other times .. meh, not so much. Nothing really stands out, it can only be as interesting as the questions and the answers. I love the conversations between Hank and John (or John and Hank in 2028?). I miss some of the silliness pre-WNYC, but I understand the more serious ads and the transitions into real ads. An amazing podcast for any Nerdfighter looking for a more informal and personal look at John and Hankâs life. The podcast is hilarious and feels intimate and down to earth. Probably wouldnât be good for anyone who doesnât watch vlogbrothers. This podcast is a wonderful and easy listen for anytime you just want to relax. I am a dedicated weekly listener and every week I am left feeling happier than I did when I started. On top of all that the weekly mars news makes me feel at least slightly informed on a topic that I would otherwise know very little about. Highly recommend! Iâve listened from the very beginning and this is one of my favorite pods! I love getting to hear hank and John in monger discussion and sharing stories. Part funny, part heartfelt, part existential despair. This is a pod for our times! Thank You for making this wonderful content while simultaneously making other content in different fields. 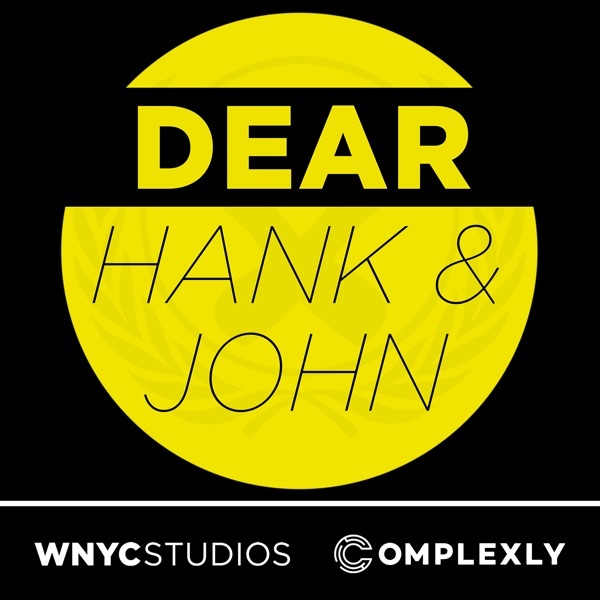 Dear Hank and John is one of the last non-corrupt things in the world (along with your other content) please keep up the work and thank you for making me smile every Monday night! Peace Love and Snappy (The donât snap while you drive T-Rex), -BlondieThank You! I love the hall of presidents!Holy Crap I used to live in Georgia!! Iâve been listening since the beginning and this podcast got me into listening to podcasts. Itâs so much fun to listen to the brothersâ relationship. I enjoy the fact that itâs fun and makes you think. It is the best comedy podcast about death with this weeks news from Mars and AFC Wimbledon. Am I a Nerdfighter Now? My husband introduced me to the Vlog brothers, but I never considered myself a nerdfighter until I started listening to the podcast. I have been a fan of the pod from the start thanks to the brothers' interactions, their occasional good advice (and hilarious dubious advice), and the intelligent conversation. I'm officially part of the fandom nowâand the tribe. Best comedy about death you can find. This podcast is great. If youâre a long time nerd fighter or new to the nerd fighter family, I can recommend this to anyone.Also some great death based humor. Hank and John are people who I can relate to, in age, gender, and socio-political biases. I am always amazed and inspired by their abilities of relating to people unlike them with a genuineness uncommon in culture. This has been a favorite for years and I love to hear it evolve. Hilarious, clean, interesting, conversational, informative, and absolutely beautiful. The only podcast I need to listen to. I downloaded iTunes just to tell you that, as a former Ohioan, your discussion of salads in Ohio was simultaneously the most hilarious and relatable thing I've ever heard. I had to sit on the floor and laugh/cry for 5 minutes. Thank you for making a great podcast! DFTBA & come up with great long cons. Thereâs a scene in classic 1999 teen movie â10 Things I Hate About Youâ in which the main character ponders, âYou know how to can be overwhelmed, and you can be underwhelmed, but can you ever just be whelmed?âYes you can, and itâs by listening to this podcast. Thanks for some relaxed, smart, funny sounds. Love you guys. I love this podcast so much! I have been on the lookout for a comedy podcast that makes me laugh without making me cringe, and this podcast hits the spot. Funny, clever, and often insightful too, you've got to give this podcast a listen. Definitely my favorite comedy podcast about death. Always up for more Green Bros. Frankly I've often said I would listen to the Green Brothers talk about anything. And now I do! This pod is constantly delightful. The only thing better is Dear Katherine and Sarah. I don't agree with their opinions most of the time. Marginally funny. Has it's moments but still has a ton of misses. Still wanted to give them a decent rating because they are marginally good natured when not affected by TDS. This podcast has taught me everything I know about sports, but the knowledge is too specific to have conversational use. Every Plum Has Itâs Thorn is the best episode of this podcast. You are so welcome. So Iâd never listened to this podcast until a few weeks ago when I went to Hankâs show for his book tour, where there was an episode of Dear Hank & John live, which I loved, so I went home and listened to a bunch of episodes, which I love so so much. What is this the newest session of game of thrones. I love the Green brothers and their offbeat humor. The relationship is the driving force behind this podcast and it is a wonderful thing. Thanks, Hank and John or John and Hank for being a bright spot in an ever darkening world. DFTBA forever! This podcast is better than double-stuf Oreos.